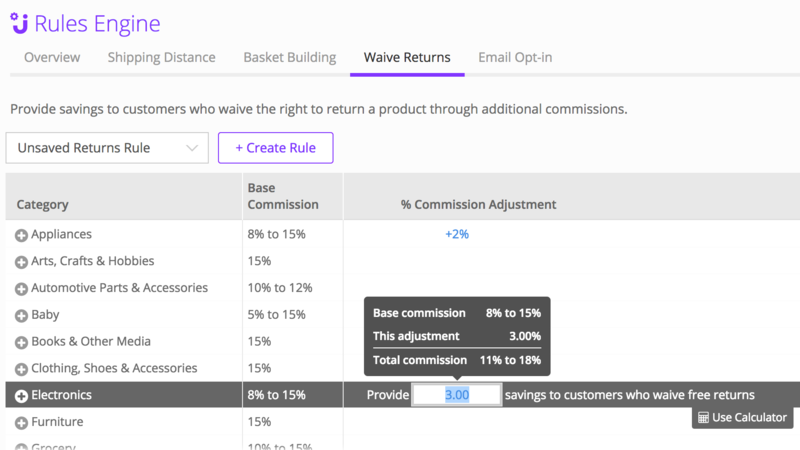 The Jet Rules Engine is a suite of tools in your Jet Partner Portal that allows you to offer shoppers special discounts based on item quantity, shipping distance, and waiving of free returns. Sellers that optimize these settings see significantly higher units per order, order values (+45%) and gross profit per order. Log into your Jet Partner Portal. Click Rules Engine on the left sidebar. 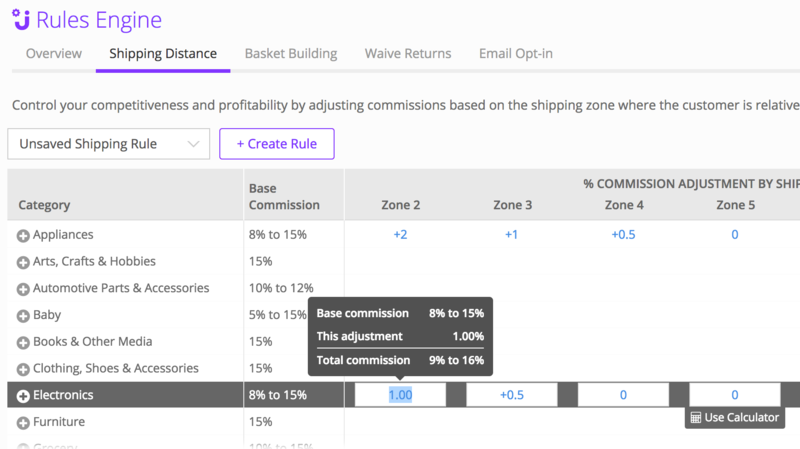 The Basket Building rule allows you to offer volume-based discounts for specific order size bands. As you can see from the video below, the system is designed to be flexible and encourages experimentation. For example, for all orders between $25 and $50, you can offer a 2% discount when the shopper purchases 2 units, and a 3% discount when they order 3 or more units. Jet then displays these savings opportunities to the shopper on the product listing and factors in these savings when selecting the winning seller of competitive products. For example, you can offer a 2% discount for orders in a specific product category shipping to Zone 2 and a 1% discount for all orders shipping to Zone 3. Wondering how zones look from your warehouse? Check out this dynamic zone map based on ZIP. As if this isn't cool enough, you also have the ability to offer additional discounts to shoppers that agree to waive their right to a free return. What are you waiting for? Start tinkering with your Jet Rules Engine!